it is the first time in over a year that i am again working full time (ish) hours. so between working on my feet, my bike commute, walking my dog for hours, teaching & practicing yoga and cross training, my days often turn into 100% activity. sitting becomes an unknown luxury i can not afford. i love all my activities, i really do. but life can get exhausting. my dog is a large responsibility, and now being single, she is my handful and mine alone. it's difficult to find time for myself to cook or clean or do 'house stuff' without her whining for attention. there are only so many seven-dollar bully bones that i can afford to keep her occupied... (so this is why young parents let their homes go to crap. duh!) and until recently, i've always been one to pack gourmet lunches for work, but now the lazy route of eating at my restaurant has it's appeal. thank goodness we have great food! i could happily subsist off of our quiche and moroccan chickpea salad. but i try to make time a few times a week for cooking projects at home. this week, i bought a bushel of corn. well, not literally. but i got a little over zealous when i realized that local sweet corn was finally available. anyhow, i could eat corn on the cob for a week, or!! or i could make something new. something exciting... this salad has great complexity in flavors and textures, while still remaining simple. you must try it! mix all ingredients together in blender to combine, leave some specks of parsley. cut kernels of corn from cob and add to large salad bowl. coat with 1/3 cup of the dressing. 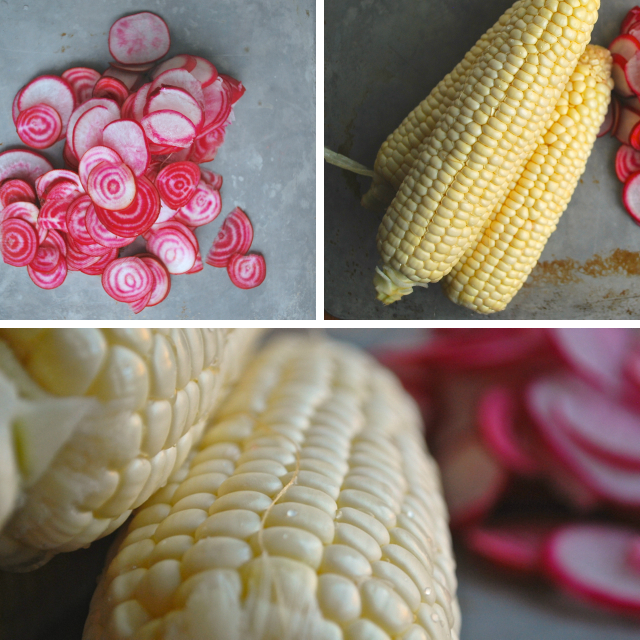 using excellent knife skills or a mandoline, finely slice the raw radishes and beets into very thin rounds. sprinkle over the salad and garnish with capers and extra parsley. for presentation, i liked just the dressing on the corn, but if you prefer, you could mix all ingredients together to coat with the dressing. you will have plenty of left over salad dressing. either scale it down by 1/4 if you wish to not have leftovers, as the dressing will only keep for a 3-4 days in the fridge. or, use the dressing in veggie wraps, on salad greens, over eggs, in a sandwich or as a dip for raw veggies. delicious! 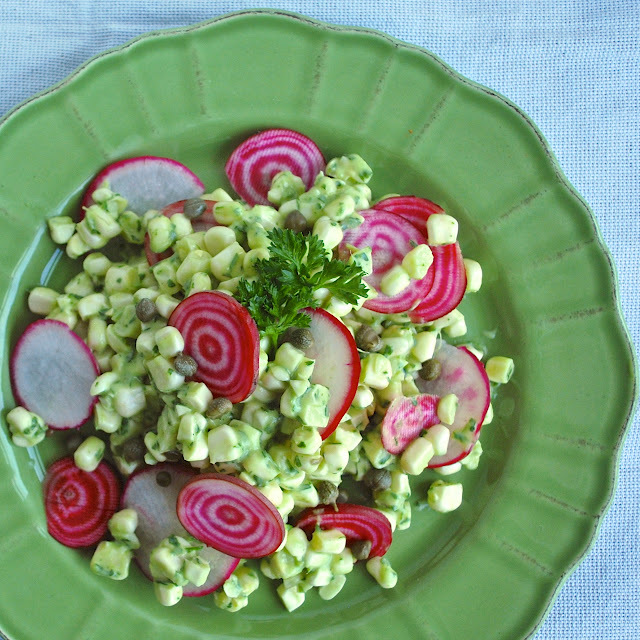 a note: i enjoy sweet corn raw in salads. if your corn is less sweet or if eating raw corn weirds you out for some reason, simply blanch your corn in boiling water for 3 minutes, drain and let cool completely before dressing. most summers, i make a trip to orcas island - a large(ish) island in the san juans, full of charm and beautiful sights. for years, i was able to stay at a friends cabin on the island and now i go up to camp or for the occasional yoga retreat at doe bay. someday maybe i'll even make it up for the exclusive doe bay music festival. cross-my-fingers. anyhow, if you ever go to orcas there are a few things i must suggest you do. hike, swim, kayak, yes of course, but there are a couple foodie spots in the quaint little town of eastsound that i frequent practically every day while on the island: kathryn taylor chocolates for delectable truffles and drinking chocolates and rose's bakery. this is my favorite bakery in all of the northwest. the garlic-parsley-walnut bread blows my mind. they also have an amazing selection of wine and cheese to drool over and an adjoined cafe well worth trying out for breakfast or lunch. but my favorite item is their fruit and nut crackers. slightly sweet, slightly savory, crisp biscuit with chewy fruit. we ate them early in the mornings on the deck looking out at puget sound. we ate them mid day while picnic-ing at the lake. we ate them late at night next to a fire as we star gazed. to me, they represent everything wonderful about the island and summers in the northwest. but it's been a while since i've been back to the island, so i thought i'd try my best to recreate these amazing fruit and nut crackers. while they turned out delicious, i can't claim to have perfectly replicated rose's recipe... you'll just have to go to orcas and decide for yourself. shucks! beat together butter and eggs. slowly mix in dry ingredients until a soft dough forms. add in dried fruit, nuts and parsley. the texture should be similar to shortbread dough. like shortbread, it is easiest to let the dough chill in the fridge for about an hour until firm. using lots of extra flour, roll the firm dough on a large surface... about 1/3 inch thick. score the rolled dough (whatever shape you ended up with!) into cracker size pieces and bake on a cookie sheet for 20 minutes at 375 degrees. at this point, the edges should be slightly brown. then remove from oven, and let cool until you can handle the cracker. then use a knife to fully cut each cracker to shape. give each new cracker a little bit of breathing room on the baking sheet and and bake for another 15+ minutes until all the edges are nicely brown and crackers are firm. remove from oven and let cool completely - possibly even letting them sit out overnight to stale and harden up more. 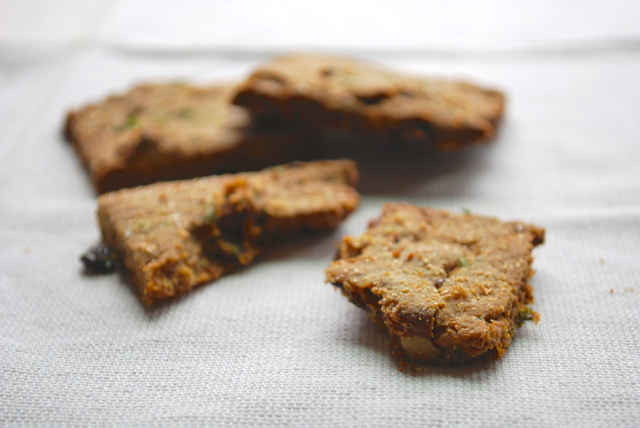 the dried fruit in the crackers gets chewy, the nuts get perfectly toasted, and the rye flour adds an amazing nutty flavor to this sweet and savory cracker. for the perfect flavor combo, top your crackers with a dab of a buttery cheese like triple creme or a smear of butter. or a little more fancy, top with a smooth blue cheese and a bit of apricot preserves. people in seattle are very finicky about weather. there seems to be about a five degree range in temperatures where everyone is happy - somewhere between 70 to 75. we complain about anything outside of that range. this week is hot. my northwest blood is boiling and my bike commute is rather sweaty. i try not to complain, but my third-floor apartment feels 20 degrees warmer than outside. needless to say, i haven't done much cooking. so after a few days of salads, yogurt and popsicles, i was craving something a bit more substantial and savory. 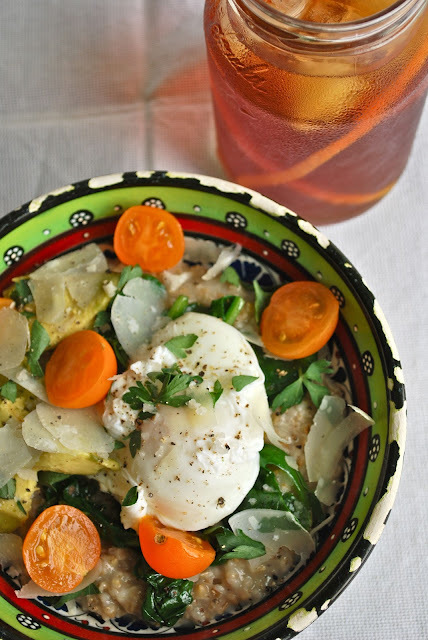 and since there are still a number of dishes i had in italy that i want to recreate, here is another italy-inspired dish. soak beans overnight, submerged in a medium size bowl under two inches of water. in the morning, bring beans to a simmer and cook until buttery but not falling apart - the skins will still have a bit of bite to them, but the bean will be creamy in texture ~ 1 hour or so, check often. you could also soak the beans starting in the early morning, and cook them off in the evening, but allow time for the beans to cool. 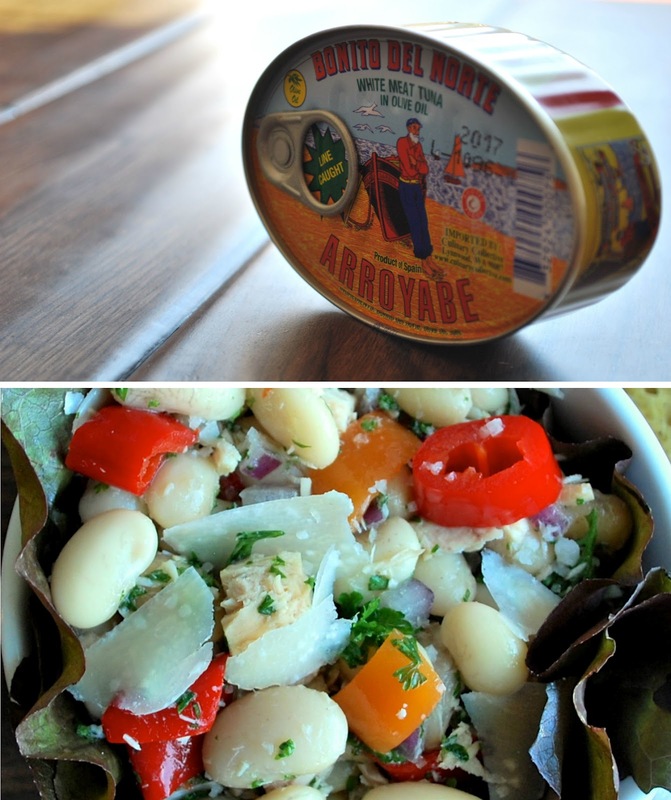 once beans are room temperature or cooler, add remaining ingredients including enough oil from the tuna to coat the salad generously. use it all if you like - yum! 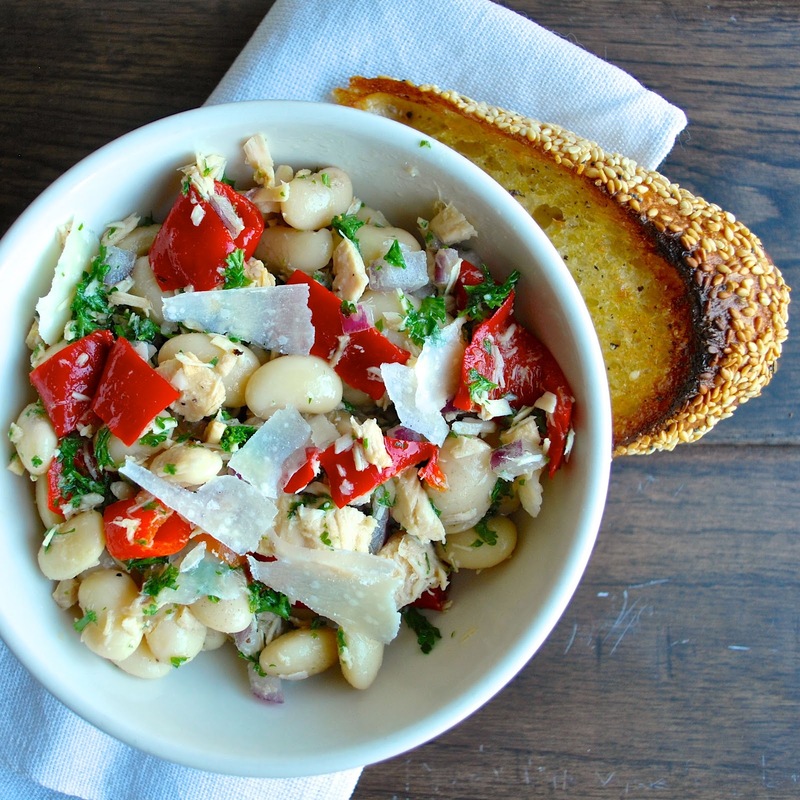 serve with toasty bread brushed with olive oil, over greens or over a bed of macaroni or other bite-size pastas! yesterday i turned twenty-four. a precarious age. i suppose our mid-twenties are incredibly formative years, as my closest cousin reminded me yesterday. but transitions are not always easy, and life is far from simplistic. and even though growth is valuable and necessary, it is rarely comfortable. so we put ourselves out on a limb - dangling like a ripe peach, where at any moment we risk falling off and getting bruised by the reality of the hard ground bellow, yet we are unable to stop growing and maturing. this week i experienced my longest fall, leaving me bruised and rather shocked that i am no longer on the branch that had supported me up until this point. but already, i can see how necessary that fall may have been for my own growth. here, bellow the branch, i have a different perspective on life, my relationship and myself. but the bruises still hurt, and i am so grateful to have wonderful friends and family to scoop me up and care for me. 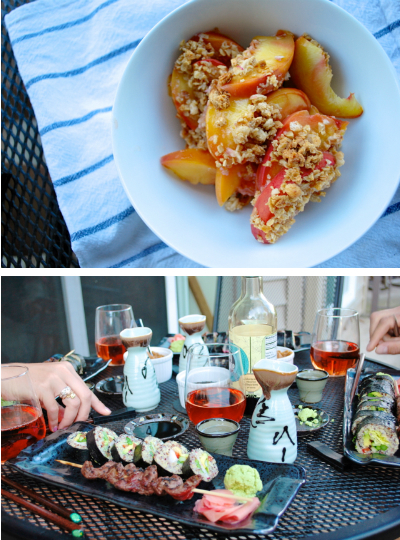 appreciation for my sister and her boyfriend who surprised me with a delicious birthday dinner of quinoa sushi rolls and ginger peach crumble. ripe peaches. and for my cousin who reminded me that growing and falling is all a part of being young and human. i couldn't have asked for better company for my birthday. gratitude also for the friends who have encouraged me to continue to care for myself. reminding me that giving and giving will only deplete me and that i must continue to nurture myself - both physically and mentally - throughout transformative times. to get outside, play, exercise, eat well, indulge, and to surround myself with things and people i love, of which when i stop and look, i have many. so twenty-four may not have been the happiest of birthdays, but it will surely be a year of personal growth. and to that, i can happily clink a glass and say "cheers." looking at other perspectives; enjoying a macaroon and espresso from oddfellows cafe; playing with my dog. once again, i've changed jobs. gosh i have a terrible track record with employers. not because i am not a hard worker or broken any rules. i just hate being an employee and i am to stubborn to put up with bull from figures of authority. being an employee is such a powerless state of being - especially for at-will employers. i've had the walk of shame with my cardboard box full of belongings after being let go from an office job. i've returned from an approved vacation to find that my employer went ahead and replaced me while i was away. i've had an employer fire me for refusing to attend scientology trainings. no, i'm not joking. but alas, until i can fully support myself through self-employment endeavors, i will continue to work as an employee. long story short, i am grateful to have found a new job that i really enjoy at a wonderful restaurant here in seattle. i wear almost every hat in the restaurant, which is lively and entertaining. 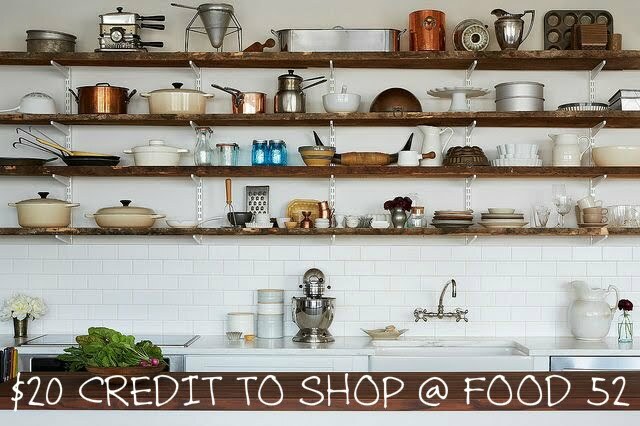 and it creates a sense of pride in the food i cook and serve there. but sometimes i catch myself wanting to geek out about food with customers to the point of suggesting they go away and try a new restaurant or wanting to suggest a recipe that they must try. this recipe popped into my head while i was chatting with a gal about oats, but i held my tongue. maybe she will randomly find this post, and will know it was directed at her. but if not, heck, you can enjoy it just as well! 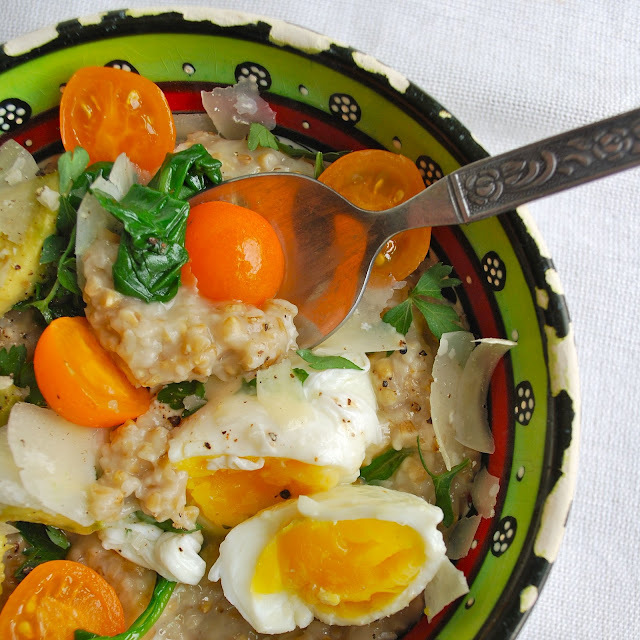 savory oats - similar to grits, but actually has some nutritional value... true comfort food, yet oh so nourishing. enjoy! bring two inches of water to boil in a small sauce pan. once it comes to a boil, lower the temperature back to a low simmer so that there are gentle little bubbles. crack an egg into a small cup. then start to stir the water with a large spoon to start a whirl pool motion. stop stirring for a second and lower the egg into the water from the cup, gently! the whirl pool will help keep your egg whites together. let cook for a few minutes and then scoop out the egg with a slotted spoon. test it with your finger for done-ness. if you want it firmer, plop it back in for a minute or two. cook to your desired firmness. then let the egg rest back in the cup until your are ready to serve it. empty the water from the pan and measure the oats and water into the same pan. bring to a simmer and then reduce heat to simmer for 15 minutes or until fully cooked but not complete mush. once done, add spinach, 1 tablespoon of cheese, salt and pepper and stir for another minute until the spinach wilts. serve warm with fresh tomatoes, herbs, more cheese and the poached egg. *if you don't like the idea of your egg just hanging out for 15 minutes while you cook your oats, you could do this in two separate pots and the timing usually works out to be the same length... just more dishes. mini bonus recipe: black tea with honey, chilled, served with orange peel is a delicious beverage at any point on a summer day. so delicious.